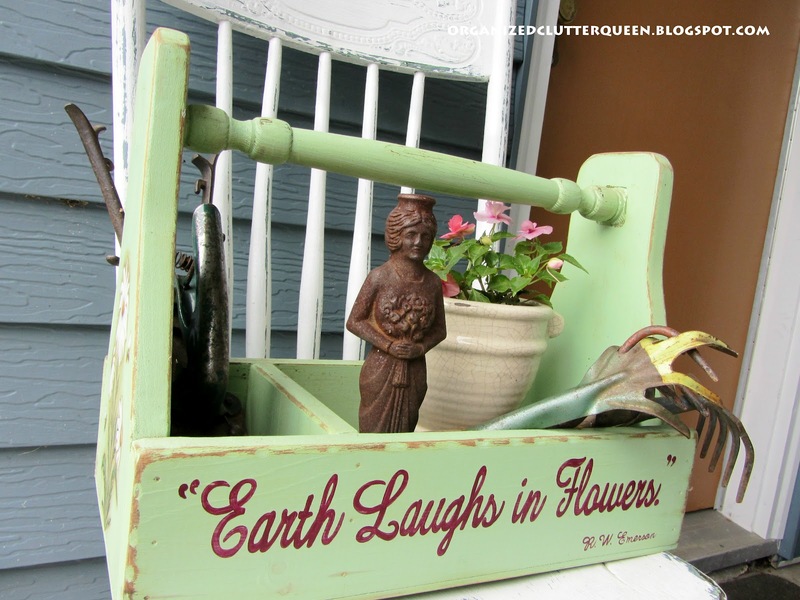 Remember my green toolbox with the Emerson quote "Earth Laughs in Flowers" painted on it, and my vintage garden tools? Today I completed the vignette. 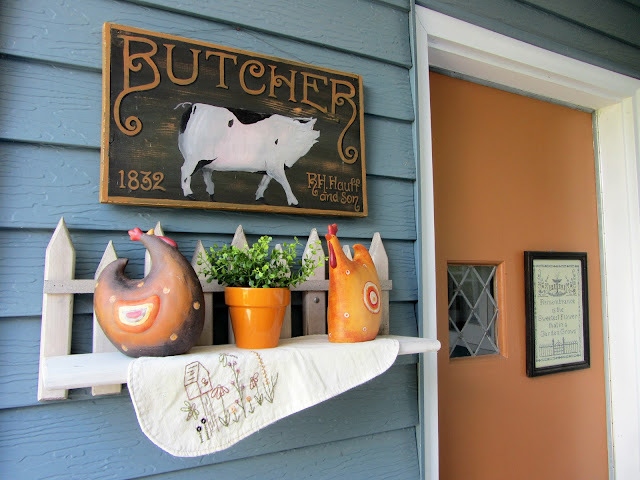 I added a butcher sign, roosters, faux plant, and a reproduction sampler. First the sign. Don't you love a "pig" sign? 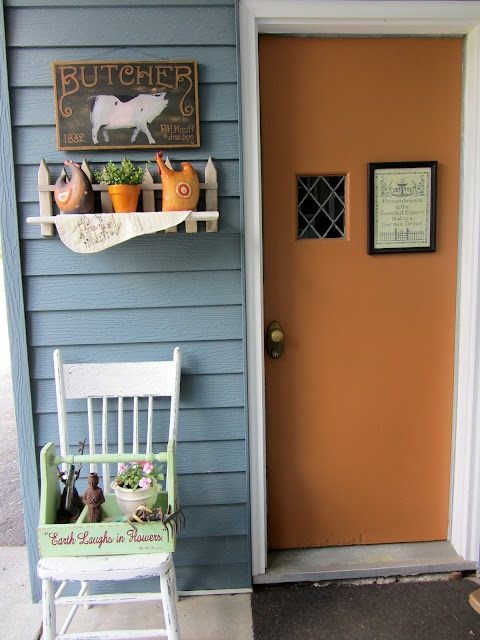 As you will see, the sign matches my door "terra cotta" accent color. This sampler hangs on my side garage door. So here is the whole vignette. Chippy chair with toolbox and vintage garden tools, shelf with roosters and faux plant, pig sign, and reproduction sampler on a terra cotta door. Despite the cool temps in Northern Minnesota, I forged ahead and planted my flower beds and pots. We dodged the frost last night, possible frost tonight, so don't expect much from these recently planted annuals. Just wanted to show you a new element to add vertical interest to my flower border besides the stepladder, a funnel on a broken handle. Two red lantana are planted in this funnel. Can't wait to see it fill in. Oh Carlene! I love your vignette to pieces! How welcoming it all is. And then you show off your garden art and I swear I swooned a bit! 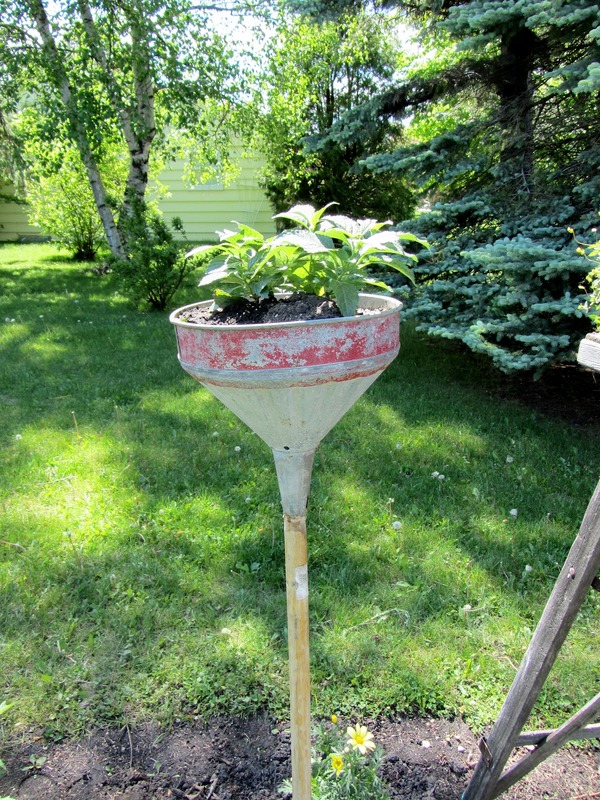 I am now on the look out for an old funnel so I can stea...borrow this idea from you! I hope the weather warms up soon for you. We will be around 70 degrees tomorrow and then 90's for the weekend. Mother Nature is having mood swings it seems LOL! Love your vignettes! That little green toolbox looks wonderful and your shelf with the strutting chickens looks fantastic. I love your vignette! You have it arranged so nicely! Thanks for sharing! Your outdoor vignette looks wonderful! You did a super job and I love that funnel planter...very creative! I love your creative repurpose of the funnel! 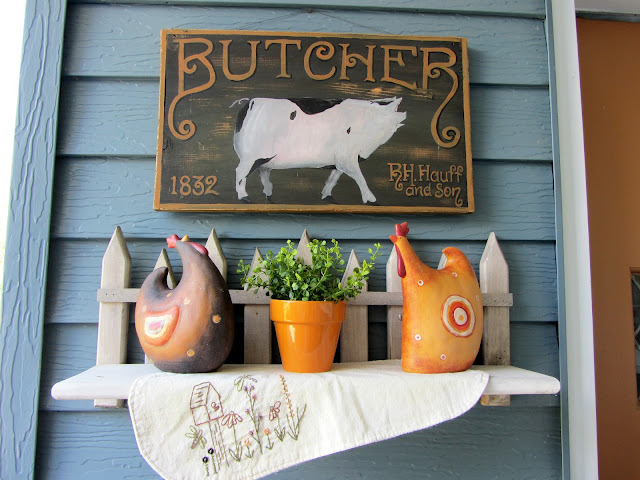 And that butcher sign is a fun addition to your outdoor vignette. Let's hope for warmer weather and sunshine for all your flowers. Wow how cute! Really well done! I always envy you ladies who can do these cute vignettes so well. I love the name of your blog, too.. just might have to follow along with you and see whats next. :) Found you through Share your cup, thanks for sharing! I love your roosters. That is a smart idea to put rocks at the bottom so they don't blow over. Never thought of that. I have a few roosters of my own in my kitchen. They make the house more charming. 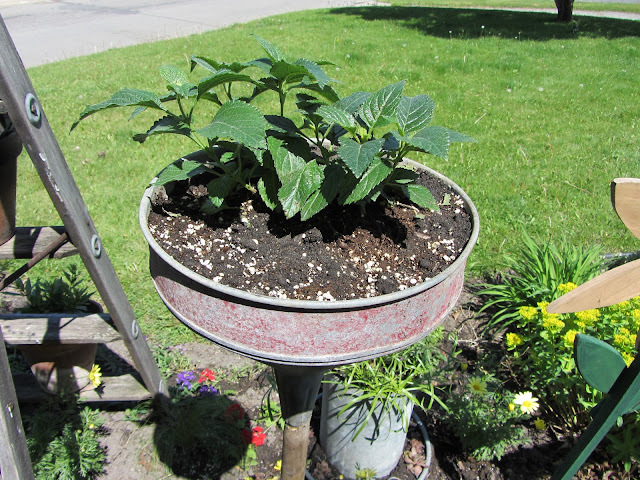 Your funnel planter is so fun! I really appreciate the creativity that goes into putting together a successful vignette, and I just love yours. I pinned your sign! So cute!! Lovely vignette :) Roosters are always charming! Love the vignette! Roosters always work for me! I just love your entire vignette, and that funnel turned into a planter is so very creative! I'm hoping it warms up in your area for your flowers sake! It was 90 degrees here today! I love when you bring an inside look outside. It looks great! Hi Carlene, I love your garage door vignette. I can't believe how well the pig sign matches your terra cotta door. Very, very cute. Boy and I slacking, I best get something hanging on my garage entrance door. I love the funnel! What a fun garden element. I have a large funnel, not quite as cute as yours with the red rim. 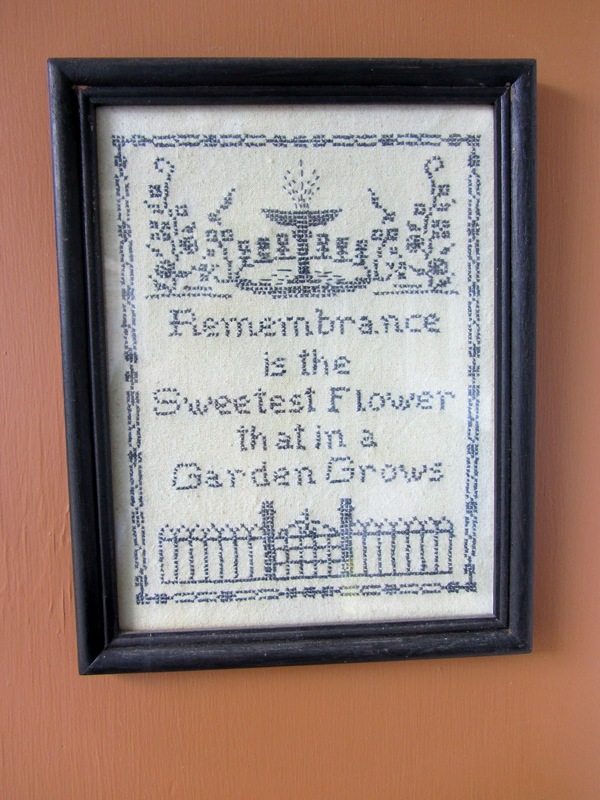 but I may need to grab it off the potting bench and pot it up. Thanks for sharing with Share Your Cup! I crown you the Queen of Repurposing!! Your outdoor vignette is lovely! 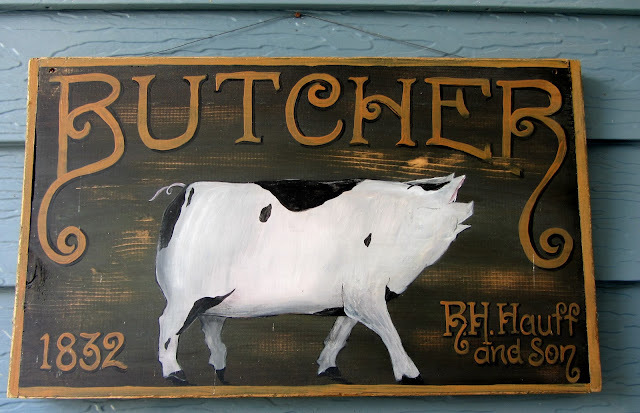 Carlene, I am in love with your new sign and the vignette is really pretty. Thanks for joining the Open House party.